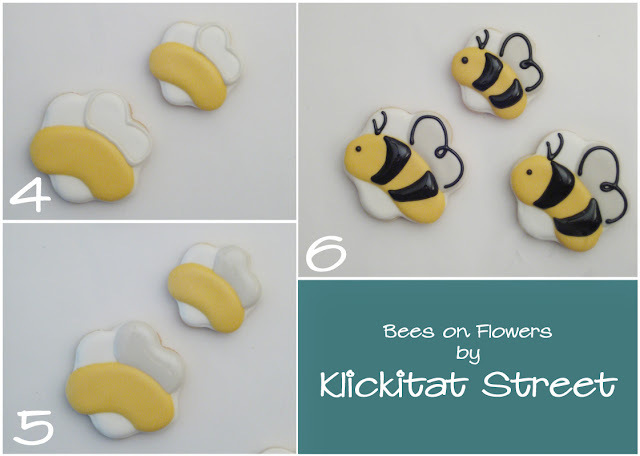 I have just a short little post today on how to make quick and easy bee cookies using a basic flower cutter. 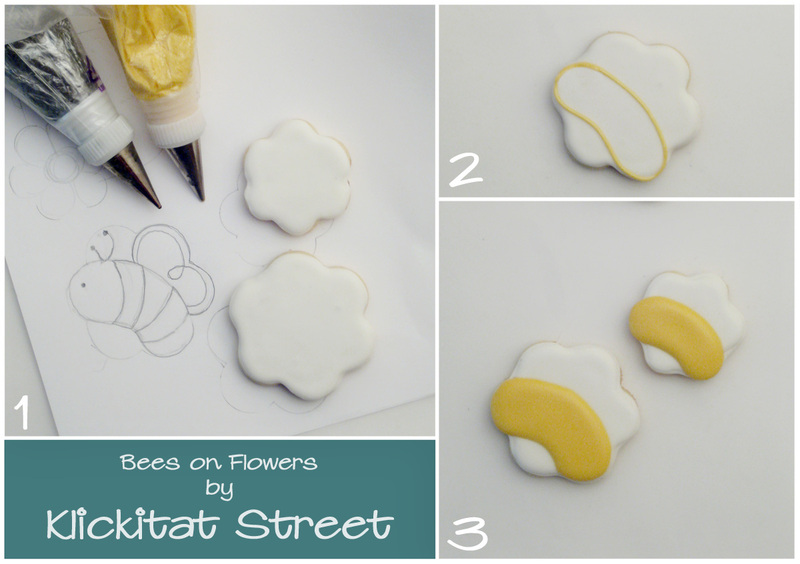 While bee cookie cutters are easy to find I like that you can vary the size and style of the bee easily by using a flower. 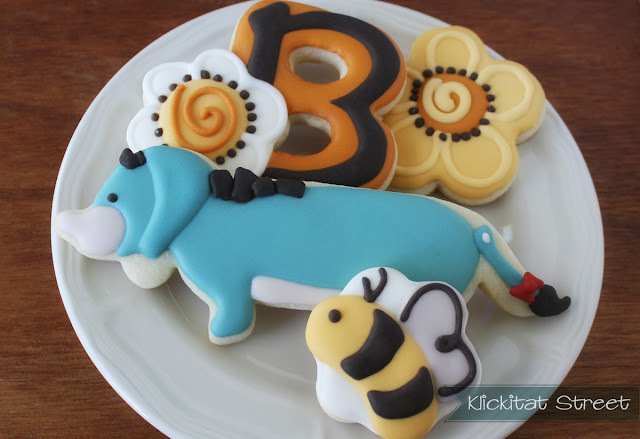 These cookies were part of a special set that included Eeyore from Winnie the Pooh so I wanted the bees to be cartoon like. Plus which, I like that there's a little pun of sorts in putting bees on flower shapes. I shoot for a 15-20 count icing for all steps and colors. 1. Start with cookies that have a smooth, dry base-coat. I used white but of course you could put your bees on colored flowers. 2. Outline the bee's body shape in yellow. 3. Immediately fill the body and allow the body to dry for an hour or so. 4. Once the body has dried a bit outline the wings in pale grey. 5. Immediately fill the wings. 6. Let the wings dry for a couple hours before adding details in black. That's all there is to it! They are super easy and so cute! 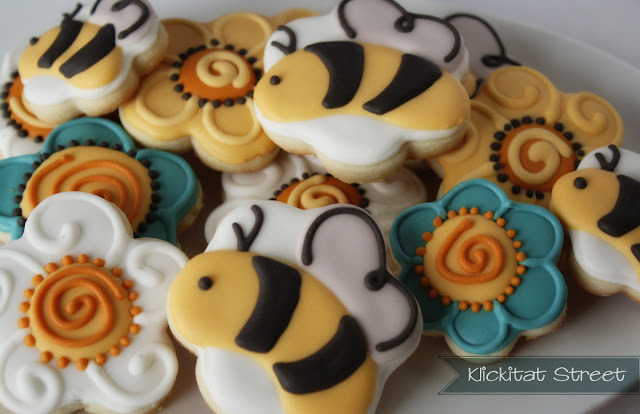 The bee cookies were part of a set I made for my favorite aunt for her birthday. Like me, she owns a Dachshund and she also loves all things Eeyore. 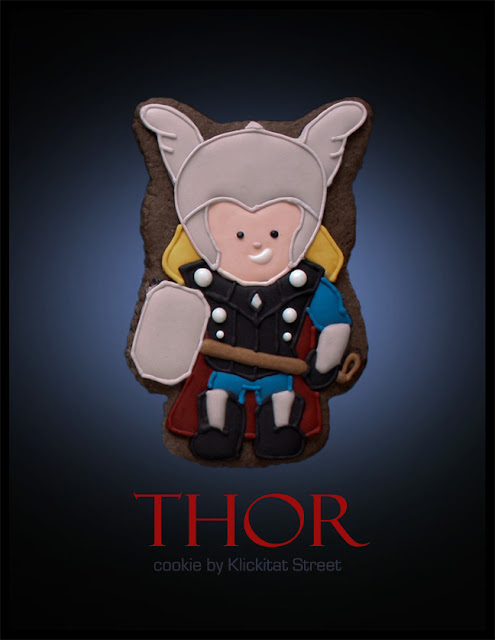 So I made her Doxie cookies dressed as Eeyore just for grins! I hope everyone is enjoying their week! The weather here has finally turned warm and it's just gorgeous! The Avengers hits theaters tomorrow and I'm super excited! 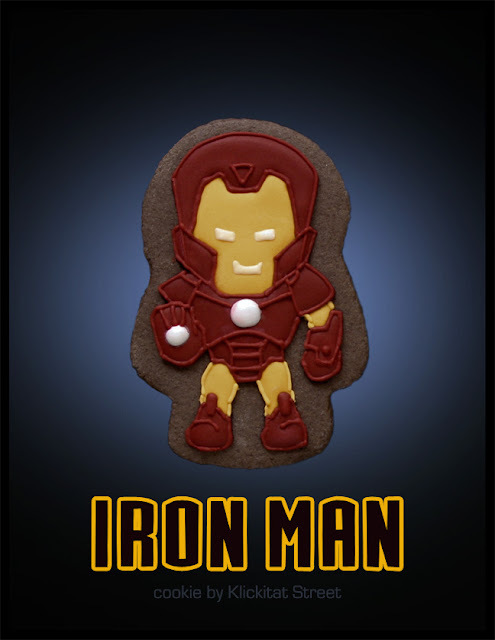 Of course I'm a bit of a nerd, (hello, I make cookies) but my nerdiness is completely random. I am not much of a Trekkie. The only think I really like about Star Trek is the recent movie where they basically re-wrote all of Star Trek. I loved Star Wars. I loathed the recent Star Wars prequels where they basically re-wrote all of Star Wars. Outside of the movies I know pretty much nothing about The Avengers. I think that's part of why I like all their movies so much because I have no idea if they did a good job or not capturing the characters or the story. I can just enjoy them for what they are. I knew quite a lot about the X-men going into those movies and I don't like them half as much. Iron Man - The Iron Man movies are easily my favorite of the group! 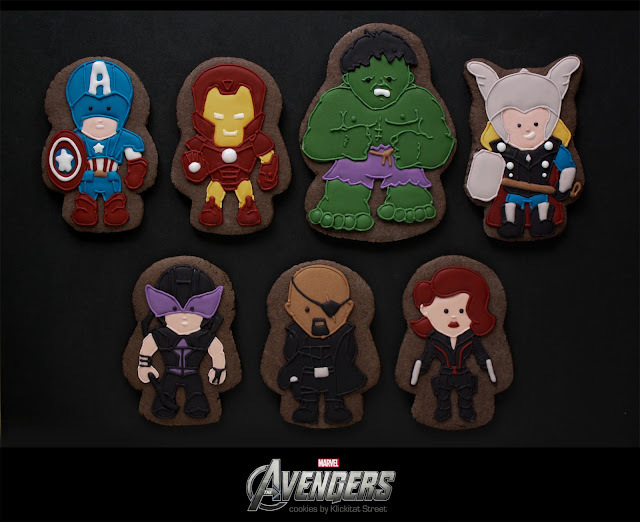 I probably should have made War Machine too just for grins but he isn't in the Avengers movie plus which I ate my extra cookie. Take that War. 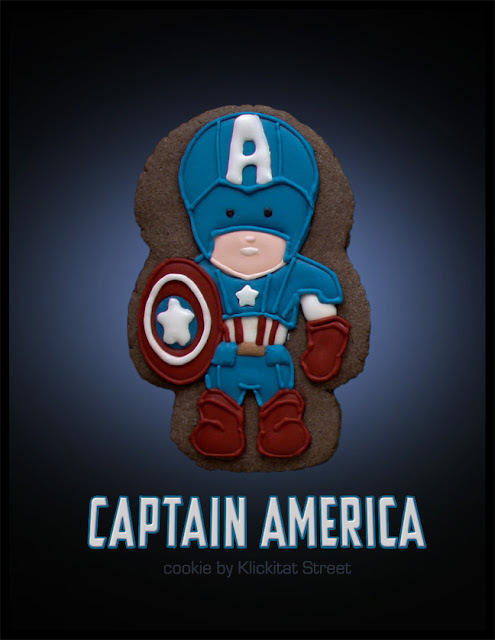 Captain America - I loved that they stayed with the historic origins of this character and kept his movie set in the past. There had been rumors the first movie would be modern and set in Iraq or something which would have been epically stupid. His movie was excellent but it was just so sad! Thor - Before his movie last summer all I knew about Thor was that if you are ever stranded in Chicago he'll give you a deal on tires. Still the movie was a lot of fun even if Queen Amidala was in it. 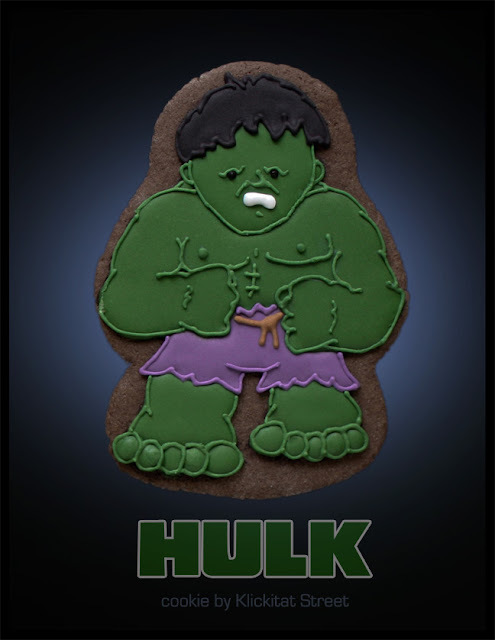 The Hulk - How much did I love Hulk as a little kid! There is yet another actor playing Bruce Banner in this movie but as the voice of the Hulk is still Lou Forrigno I hardly see how it matters. 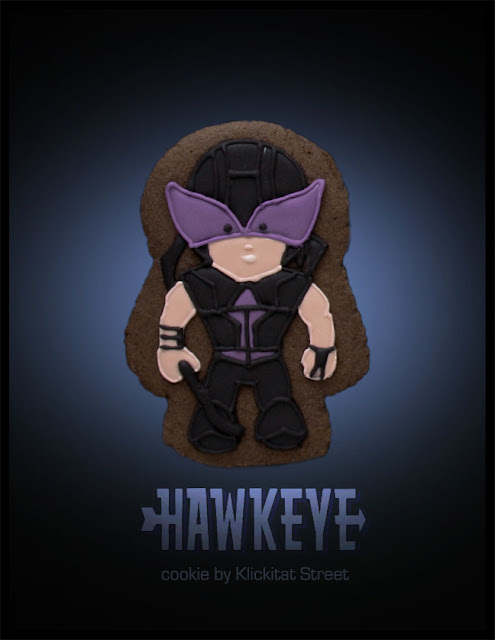 Hawkeye ...yeah...I have no idea who this guy is at all. Apparently he doesn't wear his comic book costume in the movie but his real costume includes a purple mask! You better believe that's going on the cookie. 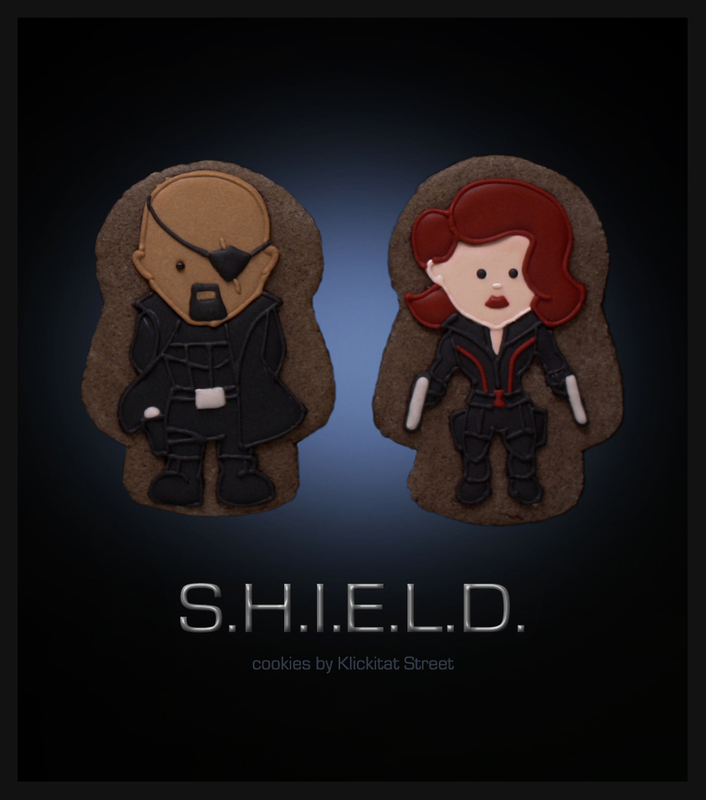 S.H.I.E.L.D agents Nick Fury and Black Widow - Samuel L. Jackson is pretty much awesome as everything even cookies! I have another post planned in a day or so with mini tutorials on all this as well as a simplified version of The Avengers cookies but these are just too much fun not to post on their own! Enjoy your weekend; I know I will!